Traveling or exploring the Outback of Australian, then discovery some great travel tips and historical landmark notes at Outback Australia. If you are traveling along the Birdsville Track, keep your eye open for Milner's Pile south of Etadunna Station. Milner’s Pile is as it implies, a pile of rocks on a small hill on the gibber plain. The cairn itself is a navigation marker built by Ralph Milner, a pastoralist who attempted the first droving of sheep from Adelaide 1860 to Darwin in 1871. Following the path of explorer McKinley he reached Coopers Creek during a prolonged drought, The Milner's were caught there for seven years, during which time his wife Phoebe (Phebe as shown on gravestone) died of *Dropsy illness and his brother John was later clubbed to death by Aborigines at attack creek (NT). His Adelaide to Darwin droving was an attempt to win £2000 offered by the South Australia Government for the first drover to cross Australia. The Milners started with 4300 sheep, 150 goats, 160 horses and two wagons. He lost 1500 sheep from poisoning around Devils Marbles in NT and sold 1200 sheep to the Overland Telegraph construction party at Roper River. Eleven years later in 1871, Ralph Milner arrive at Darwin with 2000 head through lambing. Due to a change of Government, Milner did not receive his £2000 award. Due to the drought and lack of feed for stock, Milner moved his stock to Kopperamanna after the Moravian Mission was abandoned. Then shortly after, Milner moved his stock to the site of Killalpannina near the mission. Phebe Milner died soon after arriving at Killalpannina on the 26th May 1868. Phebe's grave and head stone can be found 150m NW from the main Killalpannina Mission grave site. On my past two visits to the Killalpannina Mission site (2005 & 2007) her grave and headstone had been partly buried by drifting sands. 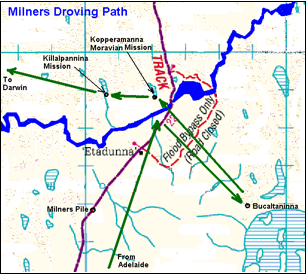 See Killalpannina Site map below for details. In 1870 Milners set out again with stock following the newly installed Overland Telegraph Line tracks to Alice Spring. Milner provide meat to the workers from this point. Later that year he arrived in Darwin. * Dropsy is an old term for the swelling of soft tissues most likely associated with congestive heart failure. Click here to view key features and the locations of Etadunna Station and missions. 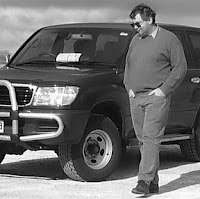 If you are thinking of travelling through the Outback of Australia you want to explore my Blog and Web Site first. Now you can share your great travel stories and favorite Outback location on my new Google+ Community. Join up to Google+ and the Outback Australia community. Sparks go flying with long range fuel tank. Copyright 2011 by Gordon Kay. Watermark theme. Theme images by mammuth. Powered by Blogger.